Do you want to download the entries from your WordPress forms to a software-ready format? With WPForms, you can download these form submissions into a CSV spreadsheet. In this article, we’ll show you how to export WordPress form entries to CSV. What Can You Do With a CSV File? A CSV file is useful for many different things. CSV, short for comma-separated values, is a file type that can be understood by spreadsheet programs such as Microsoft Excel or Google Sheets. It can be imported into other form plugins. You can add the contact information to your email marketing software. Spreadsheet software can help you analyze the results of advanced form fields or surveys. CSV files can be used to create mail-merges in word processing programs. On the setup screen name your form and select the template you want to use, depending on the type of form you’re creating. For our example, we’ll choose the Simple Contact Form template. 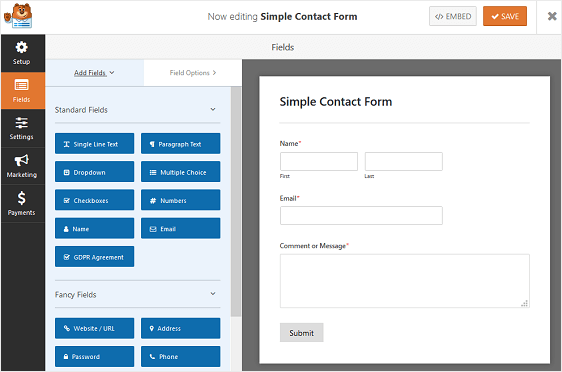 WPForms will create a simple contact form. Here, you can add additional fields to your contact form by dragging them from the left hand panel to the right hand panel. 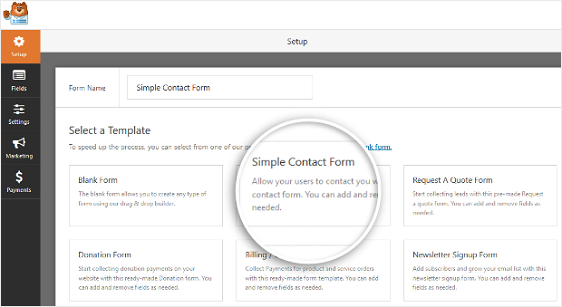 With the simple contact form template, you’ll already have the Name, Email, Comment or Message form fields. Then, click on any of the form fields to make changes. 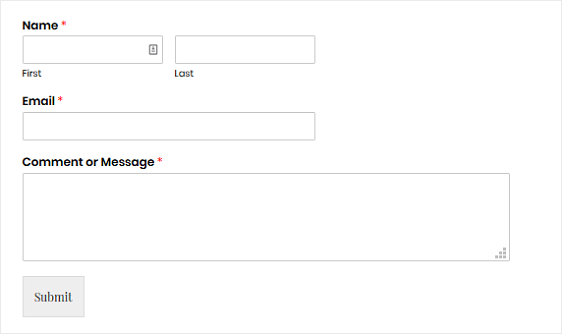 You can also click on a form field and drag it to rearrange the order on your contact form. 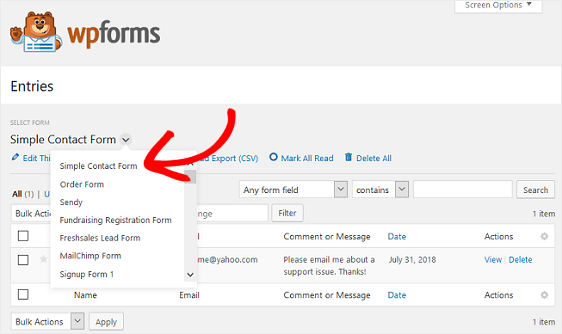 For help configuring the rest of your form’s settings, check out this tutorial on creating a simple contact form in WordPress. After you’ve published your form and gathered some entries, you’re ready to download these entries. Begin by going to WPForms » Entries in your WordPress admin dashboard. Next, in the top right corner select the form you want to download entries. Once you’ve chosen your form, click the Download Export (CSV) link. You’ll then be able to select whether to save your CSV file on your computer or open it up for viewing. And there you have it! You now know how to export WordPress form entries to CSV. You might also want to check out our guide on how to create a file upload form in WordPress so you can let people upload files to your forms. Would it be possible, either now or in the future, to display a column of entries on a webpage? In other words, if 12 people sign up for my event using a form, can I then post the entries “Name” column (data) to live update on a webpage so that participants can see who has already signed up? Great question. 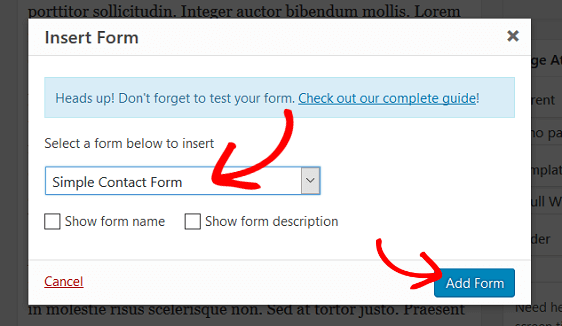 We don’t currently have any built-in way to display your form entries or select portions of entries. I can definitely see the value of this feature for tons of scenarios, though, and it’s on our list to add in the near future! Do I have to buy the pro version to view entries? Hello! I am interested in making the jump to WPForms! My current form builder solution allows me to provide a submission download URL to whomever needs to see submissions. The download URL supplies a fresh CSV each time. Is this something that is currently built-into WPForms? Please tell me yes! For our plugin CSV exports are only available to admin site users, mainly as a security measure. We do have code to easily open access up to Editor roles, though they’d still need to log into the site to be able to download a CSV export. Hello! Is there any way to customize which fields show up on the csv file? I am imported it into an Access database and don’t want to have to delete the fields I don’t want to store. Thanks!! We don’t currently have any ability to customize what fields are included in a CSV export, but I’ll go ahead and note that as a feature request. For now, the workaround is to delete those fields after import as you mentioned. Why don’t all fields export? I notice that the Status field is not present in the CSV. Great questions. Some data, like the Status column, is generally dynamically pulled based on communication with an integration like Stripe or PayPal. The CSV export doesn’t include it because this data isn’t stored in the same way as the other entry contents. I agree it would be super useful to be able to include this type of information though, and we’ve gotten a couple similar requests. I’ll make note of your request as well, and we’ll keep this in mind to consider down the road. I’m looking to post the data from a submitted WordPress form on a separate page on my WordPress site. i.e. a password protected user will enter text, images and video which when submitted will be posted or displayed on a separate page on the site. Is this possible in WPForms? Great question, and the answer depends a bit on how you’d like this to look and work. It sounds like our Post Submissions addon might be a good fit — this allows entries to be made into posts on your site. In case it helps, here’s our tutorial where you can get a better idea of how this addon would work. Our plugin doesn’t currently have the ability to restrict content (though this is definitely possible when combined with other options like this or this). This is a pre-sales question. I am using a donations plugin (Seamless Donations) that notes the names, donation amount, date, etc. of donors to the site. My client needs this data to be converted to a CSV format for further analysis. And this needs to be schedules at certain intervals. Is this doable by wpforms? How would it work? Thanks. We don’t currently have the ability to schedule CSV exports, and this must be done manually as described in this post. I’ve noted this on our feature request list, though, for our team to consider. Hi When I export to CSV the address shown is only the first part, eg Box 123,,, building, street province etc don’t appear? I’m sorry for the trouble! I order to help with this issue, we’ll need some extra details. When you get a chance, could you please contact our support team? when i export wordpress form entries to CSV do i lose all the information on wordpress or does it still remain there after i press export. I dont want to lose the info from wordpress. Great question. No worries — exporting entries to CSV has no impact whatsoever on the entries that are stored on your site. Instead, this process simply produces an additional copy of entry data in CSV format. Hi I just upgraded to PRO. I can see two test entries in ENTRIES from my form which was easy to set up and works fine. But when I download the CSV file there is nothing in it. How can I fix it? The client needs to access the data easily! I’m sorry for the trouble, and we’d be happy to help! When you get a chance, would you please contact our support team? From there we’ll be able to better assist. We don’t currently have a way to automatically do this, and CSVs must be manually created and emailed. I’ll add your vote for this to our feature request list, though, for our team to consider down the road. Also, I don’t see the download button when I go to forms on my dashboard and open contact form. I’d like to try exporting the 400+ contacts on there as a test run. Trying to compare WP form to Gravity form and a couple others cause am rebuilding our WP web site. We don’t currently have a way to auto-export to CSV, though I’ve noted this on our feature request list. And for any issues or questions about CSV exports, we’d be happy to assist! Please get in touch with our support team and we’ll help you get that sorted. Let me add a +1 for this feature request. We are going to use WPForms for our Intranet and would love for the results to go directly to an individual as a .csv file. While I understand these can be downloaded, it would really come in handy. Thanks for the consideration! HI! I was wondering if there was a way to only download the newest entries in the csv file, instead of the entire csv every time I want to update my lists? any help you can offer would be appreciated! We don’t currently have a way to select just a few entries at a time for CSV export, though this is on our feature request list for consideration. If you’d like, however, you can download a CSV of a single entry at a time. That way, you would be able to quickly merge the new data into an existing file/spreadsheet. Here’s our tutorial with details on how to do that. I never got an email notification when I signed up to the WPLite form as a test. Now it seems to get entries I have to pay? This really feels like a trap. If I can’t evaluate the Entries review in the lite version, and I didn’t get any notifications when people submitted stuff, it is as if my entries are being held hostage until I pay. Is this really what you are doing, or am I missing something? I apologize for any confusion, and Lite entries are stored only to the notification email that’s sent. If you decide to upgrade at any point, you’d be able to store new entries to your site. However, notification emails are included within Lite so it sounds like you’re running into email delivery issues (this is when the email is sent, but something prevents it from delivering successfully). We’ve shared all of the details on why this happens, and how to fix it, in this tutorial. I hope this helps! If you have any questions, please know we provide limited complimentary support to Lite users in our Lite support forum. Thanks! Hello, is it currently possible to auto-export csv? We really need this function. Definitely looking for a way to schedule the CSV export. Weekly, monthly – some interval to allow us to confirm all email notifications were received, without having someone manually retrieve it. So hopefully it’s high on your feature update list, or you can recommend an additional plugin that would allow us to do that. Recently switched from Contact Form 7 as I thought this had a nicer interface but seems CF7 has more add-ons. We don’t currently have a way to schedule an export like this, but I’ve noted your request for this on our feature request list for possible consideration. Thanks for the suggestion! In case your goal is to use the CSV to add entry details to a spreadsheet, you might consider integrating your forms with Google Sheets. This option can be super useful, as it automatically adds all new entries to a spreadsheet. If you have any questions about this, please get in touch. Thanks! Is it possible to export any notes added to entries after submission? It seems a little odd that the note doesn’t export after being added via the form entries page. I apologize, but we don’t currently have a way to export notes within a CSV. I’ve added that on our feature request list for possible consideration down the road. I’m not sure if this will be a helpful alternative, but just in case — you can print individual entries with notes (here’s our tutorial with full details). Currently, our WP Form exports a Name (First name, last name) which does not give us the ability to sort on Last name. I don’t see anything in this tutorial that shows me how to change this. Instead of using the name field, you can set up 2 single line text fields and place these fields side by side with a multi-column layout. If you need any further assistance please feel free to reach out to our support team. When I click on Download Export (CSV), the file created is all messed up. All my fields are on one line and the “answers” are on the line under. No columns, no space at all.